This 8 day Classic Package for Experienced Riders is a unique opportunity to discover the nature and wildlife of Northern Tuli on a mobile horseback safari. This Botswana package tour starts and ends every Sunday in Johannesburg, and includes early morning transfers by road through the Limpopo Region of South Africa. 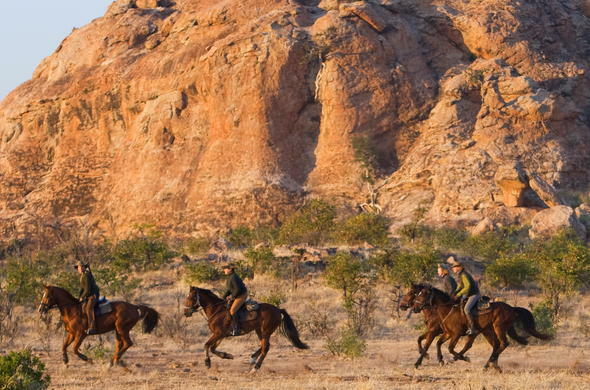 On this 8 day Tuli on Horseback Safari Experience, you will spend a satisfying 6 to 7 hours in the saddle on most days, discovering the wonders of the Northern Tuli Block with its abundance of game and magnificent scenery. You'll stay in various wilderness camps and also spend 2 nights sleeping under the stars in the Kgotla, an old tribal court. Each horse has been carefully chosen for its temperament and ability to be ridden with ease. The horses are schooled to a high level and are equipped with comfortable English saddles, saddlebags and water bottles. A few Australian stock saddles are available for those who prefer them. 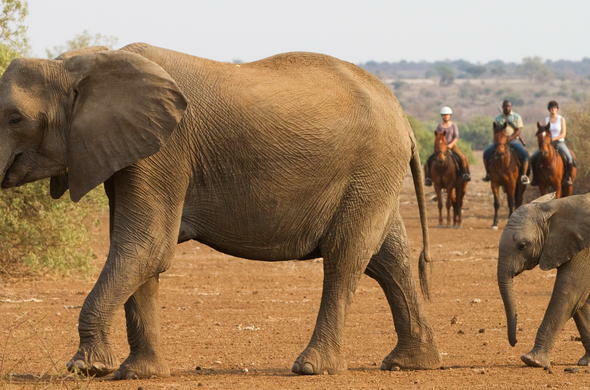 Tuli, known as The Land of Giants is an awe inspiring destination with a spectacular landscape and wildlife such as Elephant, Lion, Cheetah Wild dog and even Leopard. You'll cover about 193km (120 miles) during the course of your Botswana safari, ending most days in a well appointed walk-in tent with beds, cosy duvets and a hot shower. Enjoy sundowners and fine dining in the wilderness on your African horseback safari. Your Botswana holiday begins! There will be an early start today in Johannesburg. You will meet your driver who will take you by road through the Limpopo Province of South Africa to the Pont Drift Border Post of Botswana. This journey takes about 5 hours and 30 minutes. Upon arrival at the border you will be met by your guide and transferred to the first bush camp. You will have time for a light lunch, before heading off to the stables to meet your horse. To make sure that you and your horse are well suited, a short introductory ride will be arranged. Enjoy a sundowner at the Stable Bar while the sun sets and the horses roll and frolic. Then, it's back to camp for a hot shower and a delicious dinner served in the Ilala Palm dining room. There will be a wake-up call at sunrise with tea or coffee brought to your tent, followed by a light breakfast. It's time to mount up and set off in a northwesterly direction for your next bush camp on the banks of the Jwala River. 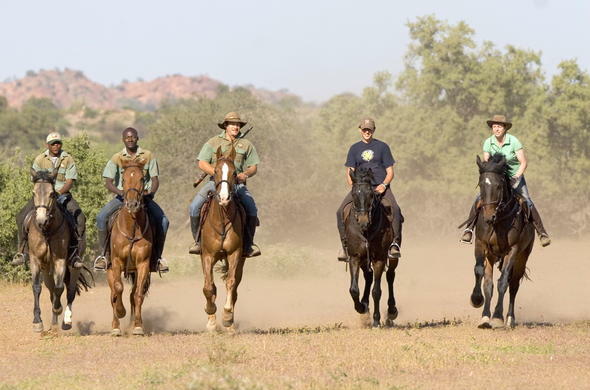 Enjoy a day in the saddle, game viewing and exploring this stunning land of history and legend. After arriving at the bush camp, lunch will be served, followed by a guided afternoon walk. This is a great opportunity to examine your environment in detail. Dinner is prepared over an open fire - enjoy the renowned bush cuisine before retiring to your spacious tent, where the sounds of the wilderness will lull you to sleep. Your early morning wake-up call heralds a new day. Tea, coffee and a tasty light breakfast are served around the log fire. Today, you and your sure-footed steed will cross over basalt ridges following ancient Elephant trails. Later, enjoy lengthy canters to make up for time lost while traversing the ridges. You will be in the saddle for about 6 or 7 hours and arrive at your next bush camp in time for a late lunch. You will spend 2 nights sleeping around a log fire, "under the stars" in the Kgotla, an old African tribal court. This is a traditional open-air enclosure (boma) made of lead-wood logs set up in the shade of a century old Mashatu tree. In the afternoon, there is the option to visit a local village where you can purchase hand-crafted Ilala Palm curios, view Bushman paintings and enjoy a sundowner overlooking the Motloutse River. This morning you set off on a full day exploration of the sandstone formations in this area including the famed Solomon's Wall. Ancient civilizations stored their wealth among these hills which are located at the confluence of 2 mighty rivers, the Limpopo and the Motloutse. Today you will be riding for 4 to 5 hours, leaving time in the afternoon for a visit to the archaeologically rich Mmamagwa Hills. This setting offers 360 degree views of the reserve and a perfect spot to watch another spectacular African sunset. Back at the bush camp, dinner is served around a large crackling fire. Enjoy the starry night skies and savour the unique atmosphere of the tribal court. You'll drift off to sleep listening to the sounds of the African bush. You rise early again and enjoy a good breakfast around the log fire. This is probably your longest day of riding as you wind your way through the Mopane bush before reaching the more open plains. On arrival at your wilderness camp you can enjoy a refreshing drink and a well-deserved lunch. This evening you will have an opportunity to explore the Northern Tuli region on a game drive vehicle and see if you can locate Wild Dog, Cheetah, Lion and the elusive Leopard which this area is renowned for. This morning will begin a little slower in preparation for 5 to 6 hours in the saddle exploring the banks of the Mojale and Matabole Rivers, following their courses north. You'll be riding up and down river banks and through riverine forest, all the while enjoying great game sightings and exciting photo opportunities. Your lunch stop is under the boughs of an old Mashatu tree, where around 100 years ago the Zeederberg transport riders took their midday break en route to Fort Tuli. Your afternoon is at leisure followed by a guided walk into the bush. After another exhilarating and rewarding day you'll enjoy sundowners and a delicious dinner around the fire. Your ride today is rich in history and offers a variety of interesting stories about the past. You'll enjoy a really good gallop on the open Pitsani Plains, hopefully in the company of Zebra or Wildebeest! In total the ride today is about 5 to 6 hours long. You'll make your way in the direction of the Majale and Limpopo confluence for lunch, back at the bush camp where you spent your first night. Dinner is served in the Ilala Palm Rondavel. This is the last day of your Tuli on Horseback Safari. You begin with a final early morning tea or coffee and a breakfast snack over the open fire. You'll spend the morning riding along the Limpopo River before heading back to the stables where you say a fond farewell to your steed. This is a shorter ride of about 2 hours, so you can enjoy a hearty brunch at camp and have time to get ready for your departure. Then it's off to Pont Drift Border Post to connect with your return transfer to Johannesburg which will arrive in the early evening. 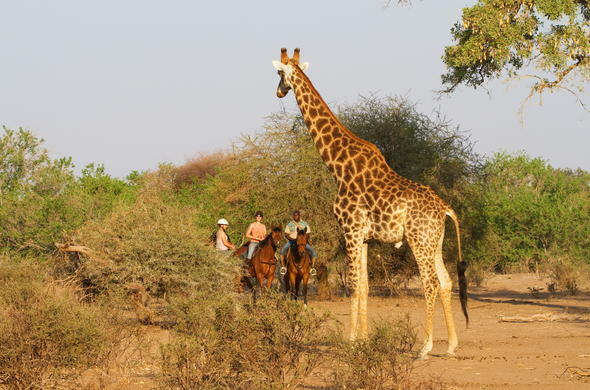 This 8 day Classic Tuli on Horseback Safari includes the road transfers ex/to Johannesburg O.R. Tambo Airport. The meeting point is at 08h00 in the morning at Johannesburg O.R. Tambo Airport, the usual drop-off time at Johannesburg O.R. Tambo Airport will be at 17h00. 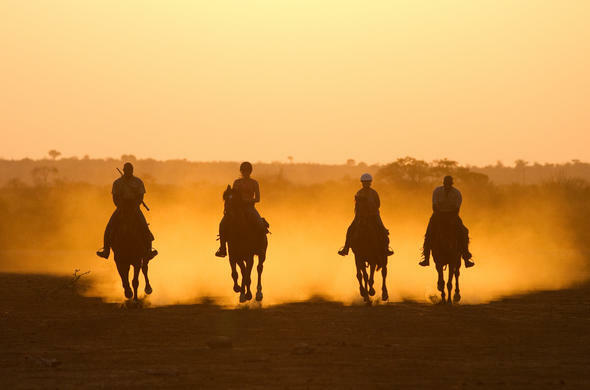 This Botswana package is only designed for experienced riders, with a minimum of 2 and a maximum of 8 guests needed to run this mobile horseback safari tour. Non-riders are also welcome and can enjoy game drives, walks and cycling. This package can be offered from April to October and starts and ends every Sunday in Johannesburg. No children under 16 years are permitted on this mobile horseback safari. There is an option to tailor the safari to a 4 or 5 day package. This Botswana tour can also be combined with a stay at Kruger National Park, Madikwe Game Reserve and also Cape Town and the Garden Route. 2 nights sleeping "under the stars"